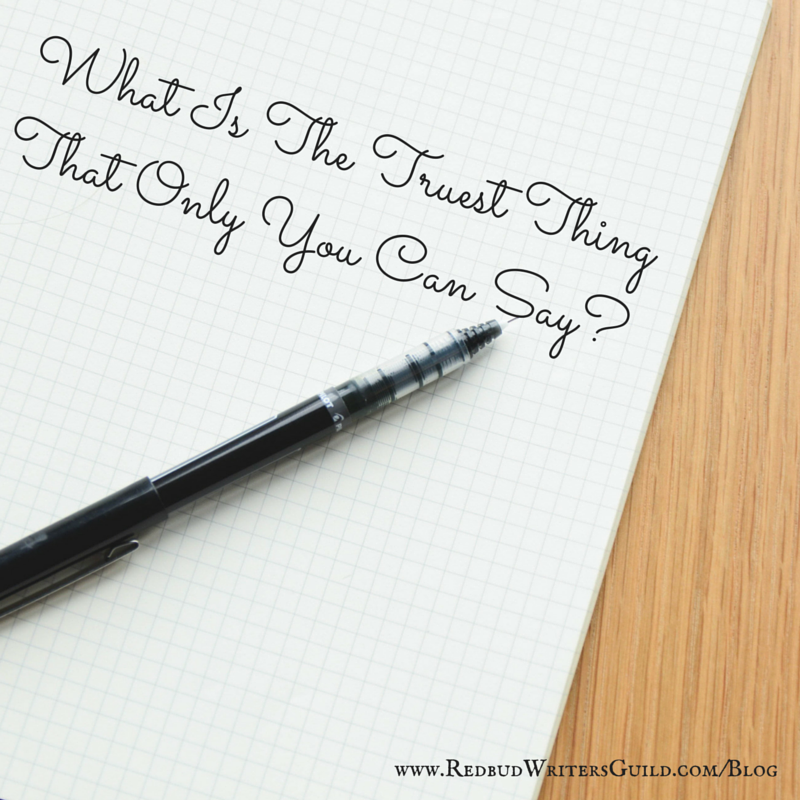 What Is The Truest Thing That Only You Can Say? After Michael Brown’s death in Ferguson Missouri last year, I wondered how I was being called to respond. Though clear that God has equipped me to be a communicator—in print and in speech, sometimes with paint or film—I wasn’t sure what to say or how to say it. To be fair, that naughty voice made some pretty compelling points. I should probably just keep my mouth shut. Late in the year, as I was preparing to be with some friends with much more legitimacy than I—Leroy Barber, Micky Jones, Romal Tune—I continued to wrestle against the wily logic of this voice that wanted me to hush up. Then the light bulb came on. (Picture cartoon light bulb exploding into brightness in the atmosphere just above my head.) In that holy moment I could agree that I couldn’t say what Leroy and Micky and Romal could say. But in that release, I realized that I could say—I had to say—what only I could say. The enemy’s sinister hiss had bamboozled me with the twisty logic that a privileged middle-aged white mom of three teenagers had nothing to say about racial injustice in America. But in that moment of clarity, when the light at last came on, I understood that I had to say what only a privileged middle-aged white mom of three teenagers could say about racial injustice in America. As I considered some of other women in my community—the ones who show up in school auditoriums for boring awards assemblies, the ones I sit beside on bleachers during soccer games, the ones sitting in the pews of my church—I began to realize that I was being called to speak up with my unique voice. Because a lot of the parents at the school assemblies don’t trust Al Sharpton. Some of the soccer parents don’t trust the radical local activist who’s organizing marches and protests in our city. Some of the ones at church won’t even trust Anderson Cooper. But most will lend an ear if I speak up. Because they already trust me, they’ll be willing to listen to me. While riding on a packed cross-country flight, I watched a mom struggle to manage an infant and two preschoolers jammed into half of row 17. Having been trapped in her position before, I knew that when the recently-potty-trained toddler needed to use the restroom, this lady would need help. And I also knew that when that moment came, she’d scan the airplane to identify another mom who could keep an eye on her oldest while she dashed to the back of the airplane with the infant and the toddler. Whether she’s at a school playground, a city park, the play area at the mall or row 17, she’ll look for a mom because she trusts moms. On a hunch, I begged Micky to join me in inviting moms, especially moms of children of color, to share what it’s like to raise sons in America in whatever skin they’re in. So, at Moms Speak Truth, we’ve featured some of those honest compelling voices. When I determined to use the experience and the voice God has given me, and purposed to trumpet the wise voices of others, the enemy who wants to hush up truth-tellers was defeated. Jesus warned us that the enemy comes to steal, kill and destroy. (John 10:10, NIV) For the record, the enemy also comes to silence: stealing courage, killing truth and destroying love. No matter who you are—even if you’re a privileged white woman—there is something for you to say that only you can say. Some of you will trumpet justice by fighting to end human trafficking. Those who have grieved will comfort others with the comfort they’ve received. Those who’ve been set free from addiction will speak the truth in love to those who are still bound. In a million different ways, God equips you—not ignoring your unique experience, but redeeming it—to speak the truth in love. Say what only you can say. Margot Starbuck, speaker and award-winning author, is passionate about communicating to individuals that they have been made for life that really is life. A graduate of Westmont College and Princeton Seminary, Margot is the author of The Girl in the Orange Dress, Unsqueezed and Small Things With Great Love. Learn more about Margot’s literary consulting at wordmelon.com, or connect at MargotStarbuck.com or on facebook.